Ehime Prefecture (, Ehime-ken) is a prefecture in northwestern Shikoku, Japan. The capital is Matsuyama. 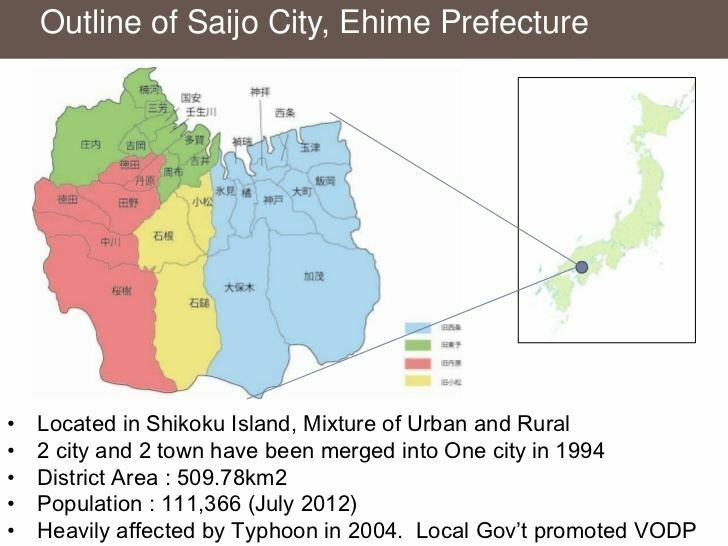 Until the Meiji Restoration, Ehime Prefecture was known as Iyo Province. Since before the Heian period, the area was dominated by fishermen and sailors who played an important role in defending Japan against pirates and Mongolian invasions. After the Battle of Sekigahara, the Tokugawa shogun gave the area to his allies, including Kato Yoshiaki who built Matsuyama Castle, forming the basis for the modern city of Matsuyama. The name Ehime comes from the Kojiki and means "beautiful maiden." In 2012, a research group from the University of Tokyo and Ehime University said they had discovered rare earth deposits in the City of Matsuyama in Ehime-ken. Located in the northwestern part of Shikoku, Ehime faces the Seto Inland Sea to the north and is bordered by Kagawa and Tokushima in the east and Kochi in the south. The prefecture includes both high mountains in the inland region and a long coastline, with many islands in the Seto Inland Sea. The westernmost arm of Ehime, the Sadamisaki Peninsula, is the narrowest peninsula in Japan. As of April 1, 2012, 7% of the total land area of the prefecture was designated as Natural Parks, namely the Ashizuri-Uwakai and Setonaikai National Parks; Ishizuchi Quasi-National Park; and seven Prefectural Natural Parks. The area around Matsuyama has a number of industries, including shipbuilding, chemicals, oil refining, and paper and textile products. The rural areas of the prefecture mostly engage in agricultural and fishing industries, and are particularly known for citrus fruit such as mikan (tangerine) and iyokan and cultured pearls. The oldest extant hot spring in Japan, Dogo Onsen, is located in Matsuyama. It has been used for over two thousand years.